Our Southlake location is at 2707 E Southlake Blvd, Suite 140, Southlake, TX 76092. 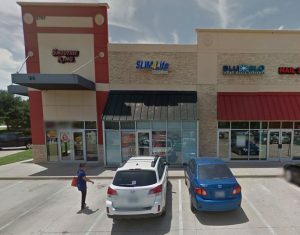 Slim4Life South lake was our 5th center to open in the DFW area in 2009. This center has clientele from Grapevine, Southlake, parts of Keller and the surrounding areas. As it is in the Corner Stone Plaza Shopping Center with Baylor Children’s and Christina’s, it is a high traffic center with client s from major corporations and major churches in the area. The Manager of Southlake was a clients who lost 115 pounds on the program before coming to work in the center. ‘This program works!’ is her message to everyone. The staff at Southlake work one on one with their clients to guide them through all the stumbling blocks to losing weight. With rapid weight loss comes increased energy and more mobility. Our clients look better, feel better and have energy levels that allow them to be more active. Call the Southlake center today! Make an appointment at our Southlake weight loss center today!